Don't forget to add the toplink-essential or any other annotation jar to your JPA project property in order to be able to manage JDK 5/6 annotations in your java code. 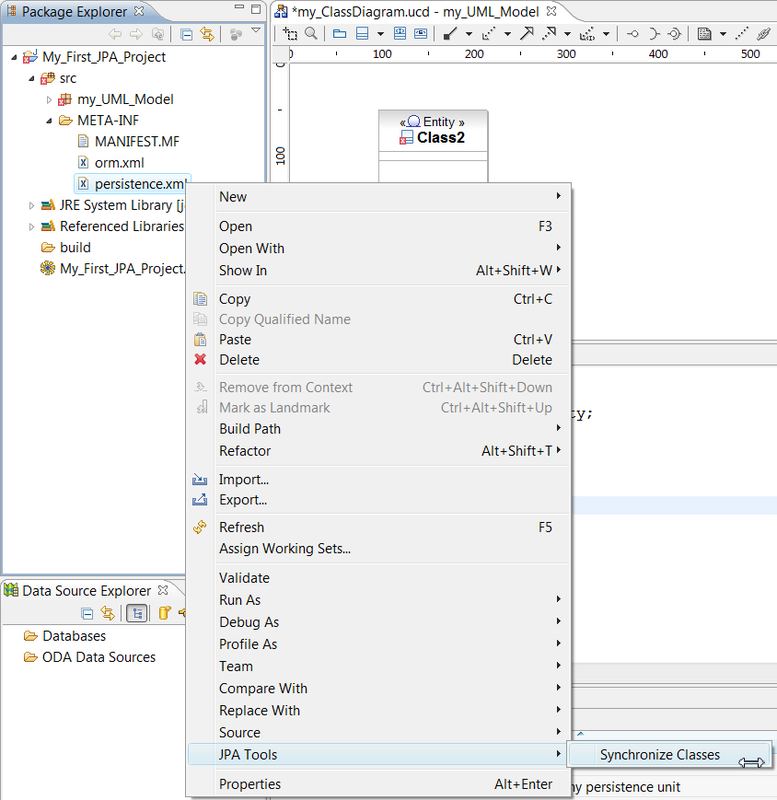 Click on the JPA Project > Property > Java Build Path > click on the Libraries tab > Add External Jars..
Click on the JPA icon in the Class Diagram Editor. 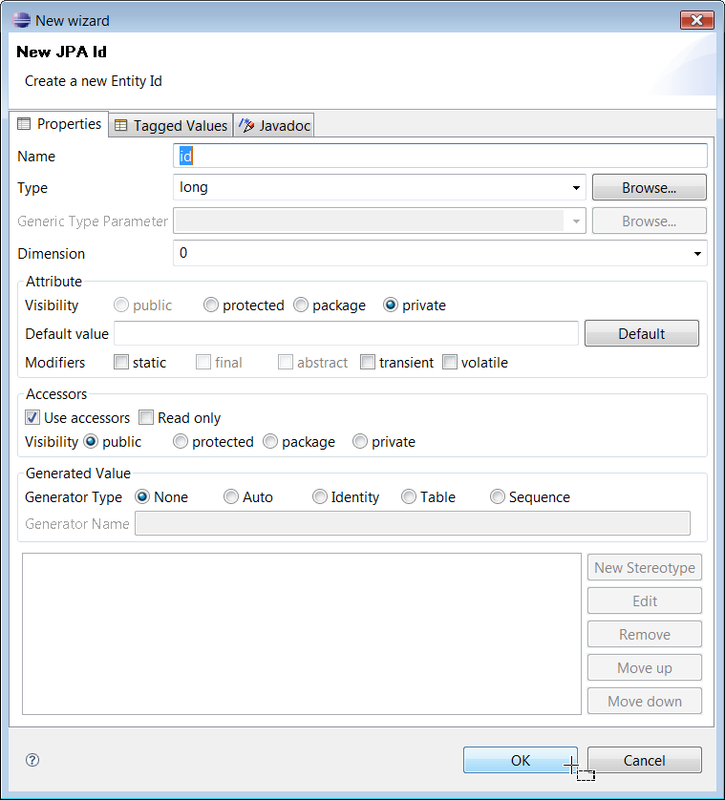 Select JPA Entity for example. Select the Entity type from the list. Select Table > Name for example. Enter table in the Value Field for example. Enter the name of the JPA Id. Enter Id in the Name field for example. Your JPA Class has immediately been created in your Class Diagram and in your Java code. 3. 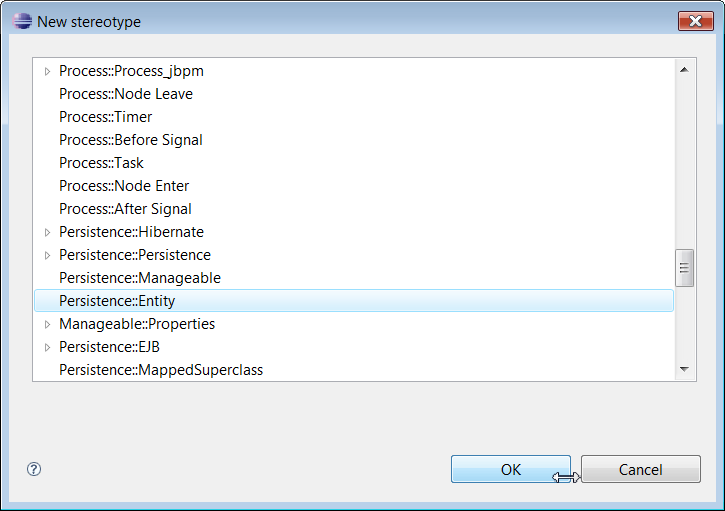 Create a JPA Class from the Class Diagram contextual menu. 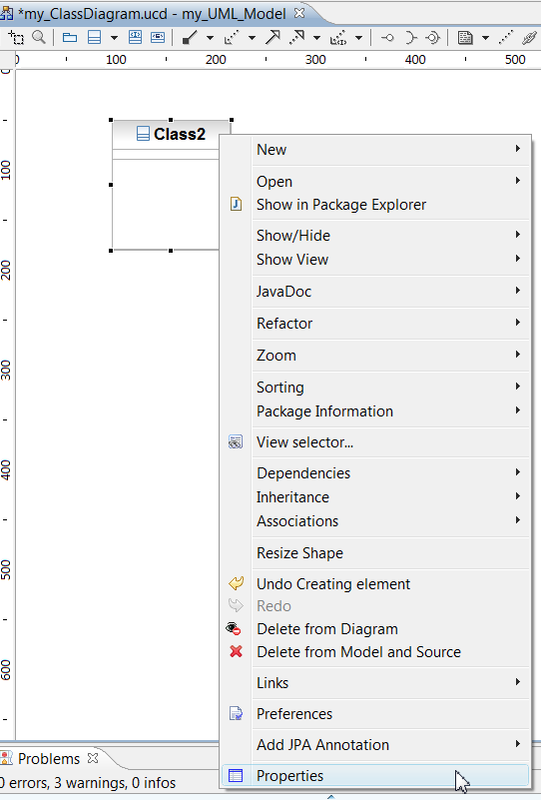 Click on the Class Diagram background > New. 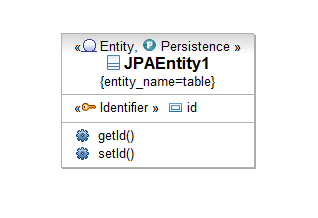 Select New > JPA > Entity > Name for example. 1. 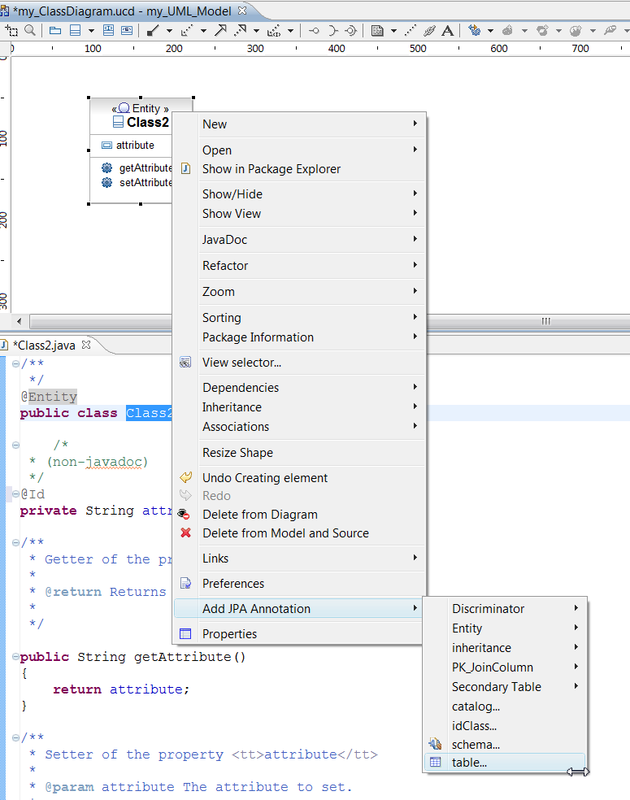 Adding EclipseUML stereotype into the UML model and getting live code synchronization to add JPA annotation in your code. 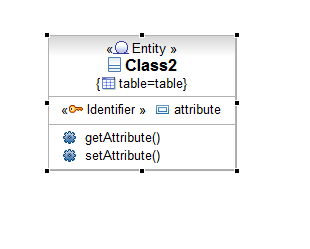 You can extend JPA properties to existing classes. For example, click on class2 and add persistence property to this class. Add a new stereotype to your class. For example add persistence properties to your class by selecting New Stereotype. 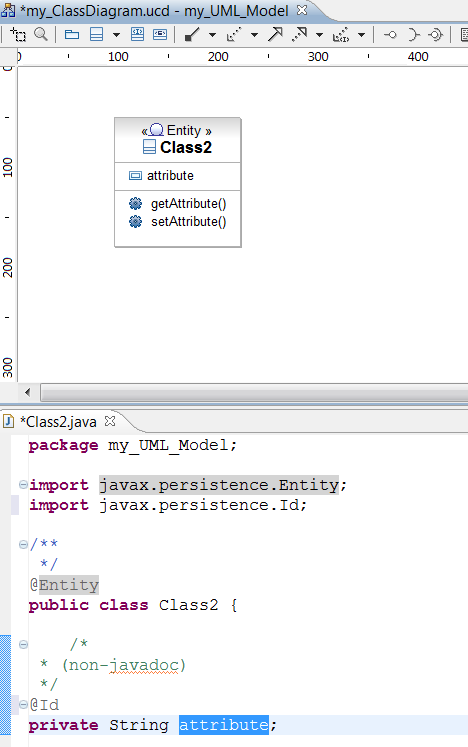 Select Persistence::Entity to map a Class and add persistence properties. It means that this class will be saved as a table in your database. 1. Using Dali plugin, or writing code to add annotation in your java code and getting immediate live from code to model synchronization. The Dali annotation will immediately be saved inside the UML 2.1 metamodel if you just add a JPA annotation in your code using the live code and model synchronization. 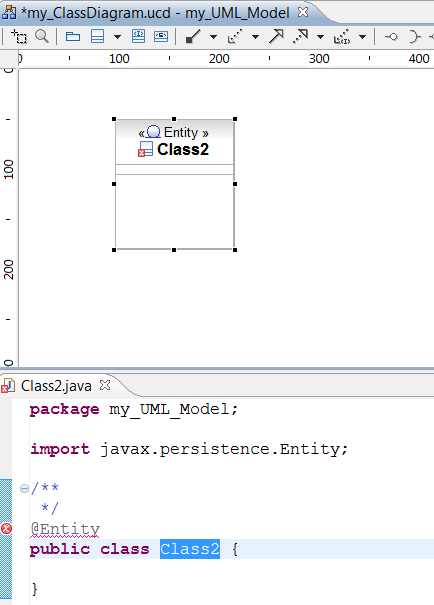 Create a class using the UML Editor or the Package Explorer menu. 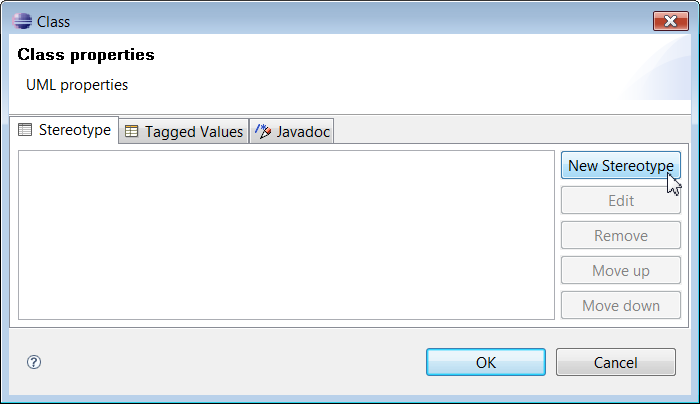 Note that the JPA details synchronization is using the Java Code Editor, therefore you need to select the Class either in the code, or double click in the class diagram on the Element. If you use the Map As top down menu and add Entity, then this annotation will be added to your code and will update the UML Editor and the UML Metamodel. The Class2 has been updated. 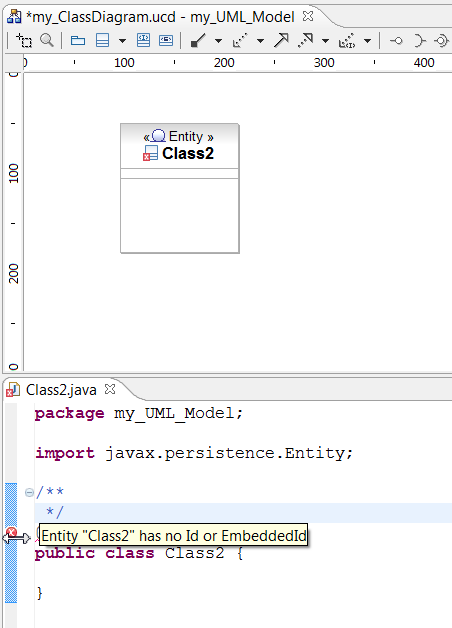 An error is in the code because the mapped class is not contained in any persistence unit. There is still an error saying that the Entity " Class2" has no Id or EmbeddedId. We are going to fix this error. We need to create a new attribute Id. 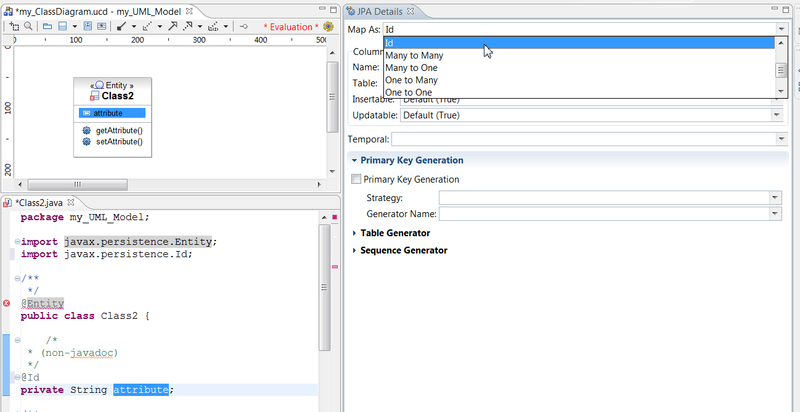 Add a map property to the Attribute. The code is now clean with no error. We are now going to use the Add JPA annotation menu. Please note that the JPA Annotation sub menus will only be activated if the Class is already an Entity. 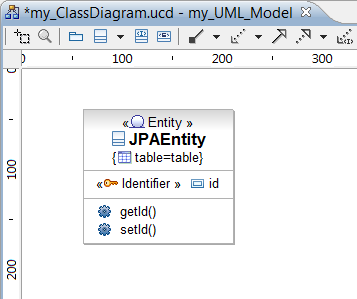 The JPA table annotation has been added in your UML Editor diagram, in your Java Code and in your UML Model. 5. Why my new JPA Class is in error ? Note that if you select Discover annotated classes Automatically at the first time project creation you will not have to synchronize your persistence file each time you create a new class :-).